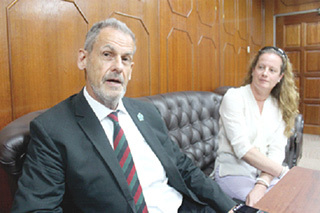 Woolley's nephew in surprise KK visit | Daily Express Online, Sabah, Malaysia. Kota Kinabalu: Geoffrey Nicholas Woolley had never seen his great uncle's fabulous pictures of old North Borneo until a few months ago. Nick Woolley is a direct nephew of probably the most appreciated colonial officer of all for his enchanting century-old pictures of Jesselton and interior natives of North Borneo – George Cathcart Woolley, a long serving Commissioner of Land from the turn of the 20th century British North Borneo, an ethnographer and ardent collector especially famous for the priceless Woolley Collections of 2,843 photographs, diaries and in some ways and artefacts that formed the nucleus of the Sabah Museum when it was first founded in 1965. But the pathos around this great guy is after his death on December 6, 1947, this rare breed of colonial administrator who regarded North Borneo as his homeland, who refused to testify against his Japanese torturers in a war crime trial probably because of his Christian conviction of amazing grace, was just buried in the Anglican cemetery, Jesselton, as though all but forgotten by his kin, it seems. But the surprise arrival this week of Nick and partner, S Booth, suddenly ignites a long lost connection and kindles a top honour that George Cathcart Woolley so richly deserves. The big surprise to us is, however famous and intriguing his uncle's pictures are to Sabahans, Nick said he had never seen them all his life, until September 2017 when he met a senior Sabah Museum curator, Stella Moo, at a dinner in London, and showed him Volume 1 and Volume 2 of Woolley's Collections published in 2015. "Yes, I have been interrogated firmly how could I not known," Nick joked. "True, I haven't seen them." On why, he said: "I knew he was famous over here to a large extent because my father told me that. But I didn't know Sabah Museum had been doing all that with his pictures and diaries. "I haven't fully realised the content of his diaries. No one had told me they existed, such as the published diaries Volume 1 and Volume 2 in 2015, until eight months ago. Otherwise I would have wanted to get a copy of them." The trigger to this tribute trip? "It was only last year (2017) that one of my second cousins, Rowing Lexter, a great nephew of George Cathcart Woolley, got in touch to tell me Stella was coming to London and asked would I be interested to meet up with her," Nick recalled. "So, of course, immediately I said: 'Yes, I wanted to meet her'. He (Rowing) then told me the dairies were published two years earlier – Volume 1 and Volume 2. To my immense delight, Stella brought a copy of Volume 1 and Volume 2 and showed many things I had never seen before in my life. I couldn't have seen them because all the materials were here (in Sabah)," Nick said. And what actually happened was his father had some pictures that he also sent over to Sabah when he was a little boy. "So I hadn't seen what had been in father's hand that had also been sent back over here," he added. The Woolley clan were a pack of 10 siblings, four of whom were "seriously famous", Nick asserted. However, the second generation Woolley were not that close knitted, Nick said. "I only met him (Rowing Lexter) for about three to four minutes before. I didn't realised he existed because none of his family communicated with me. They knew where I was but I haven't heard from them, so they were bad, I was bad. "We were both very, very busy families. We were never been involved together and sadly we were not in touch. We can all be blamed for not getting in touch with each other but, anyway, he certainly got in touch with me and Stella in this case." But to cut the story short, it was an unexpected email Rowing suddenly popped to Stella three years ago that finally led to the Stella-Nick meet up in London last September. Stella invited Nick to Sabah there and then. But it's true it takes two to tango – a Woolley and a woman! "I came home to my wife and told her and she said: 'Well there is no question we must go', which thrilled me. Certainly surprised me… but she is so supportive of things like this, things to do with the family and an incredible mother. "She immediately supported me in making my mind up firmly, that whatever in work there is, this is something not to be missed in any circumstance!" Nick praised his wife. Woolley is by the way an enormously accomplished guy too numerous to enumerate here but currently he is Managing Director of Woolley – a private company and Enrolled Practice of the Prince Foundation of Building Community specialising in asset management for city property funds and management of sustainable development projects.